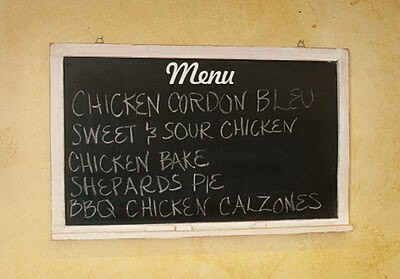 Have I mentioned here on OTBM yet that I am obsessed with chalkboards? It all started 8 years ago in Big Lots with this $1 chalkboard that I turned into our Menu board. About 4 years ago I made Friday Night Movie Chalkboard for our weekly movie nights. 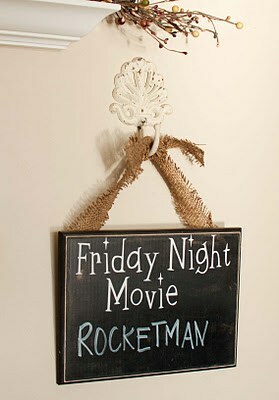 Then came our FHE chalkboard my Mom got us for Christmas one year! I have seen chalkboards painted on pantry doors all over Pinterest and I loved the idea. 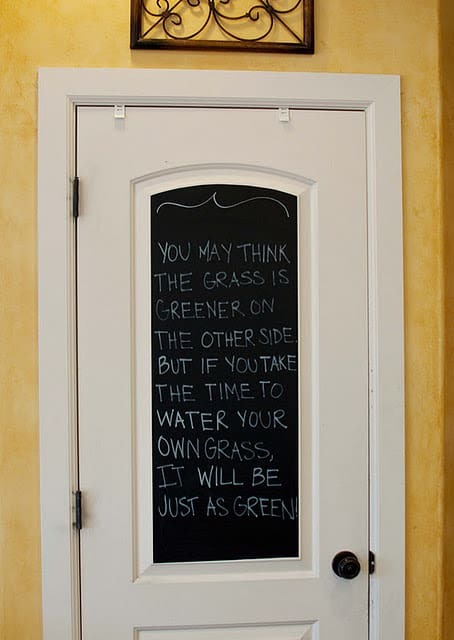 Especially since I have really wanted a place where I can put good inspirational quotes and change them often. The pantry seemed like the perfect place, considering we are always in it! I wasn’t sure how I was going to like the look though, and wasn’t ready to commit to painting it. Then I found Chalkboard Contact Paper! I bought some, cut it to size, and put it up! I really love the way it looks! I will totally paint it on to make it permanent if I have to take the contact paper down. The contact paper works really good though and I don’t see that happening anytime soon. The only thing I haven’t been super thrilled about was when I had to cure the chalkboard, in some areas it seems liked it scratched it. Thankfully you cant tell once the words are on. I also decided to try the liquid chalk markers which I love! Here is my take on them. You have to use a Mr Clean magic eraser to get them off your chalkboards. I was nervous about that since I was afraid the magic eraser was going to take the chalkboard surface off, but this led me to another great discovery! You know how it can become hard to write on your chalkboards? It’s like the chalk won’t stick anymore. After 8 years my Menu board was the worst! After using the magic eraser on it – its like new! 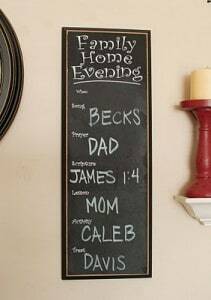 A magic eraser is the perfect way to freshen up a chalkboard! The other advantage of the liquid chalk is that it doesn’t erase, so its perfect for the pantry door! The rest of my boards I think I will keep using regular chalk on since the boys can’t reach them. 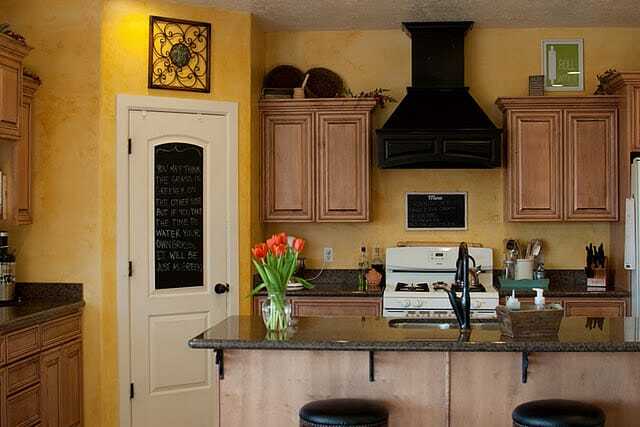 Can I show you one of my other new discoveries in the kitchen that I am so excited about! Okay, I know its like a $1 squeeze bottle. But I have a phobia of gross dish soap bottle tops. It’s lame, but no matter what you do they get gross! 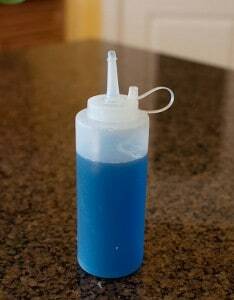 I’ve tried pump bottles, but they always eventually erode and get gross too. This is the best! I’ve been using it for 2 weeks and didn’t do anything to it before I took the picture. It stays so clean and it’s so fast and easy to squeeze out. And nothing can erode! You know it’s good when the hubs commented on how much he liked it – without me asking! 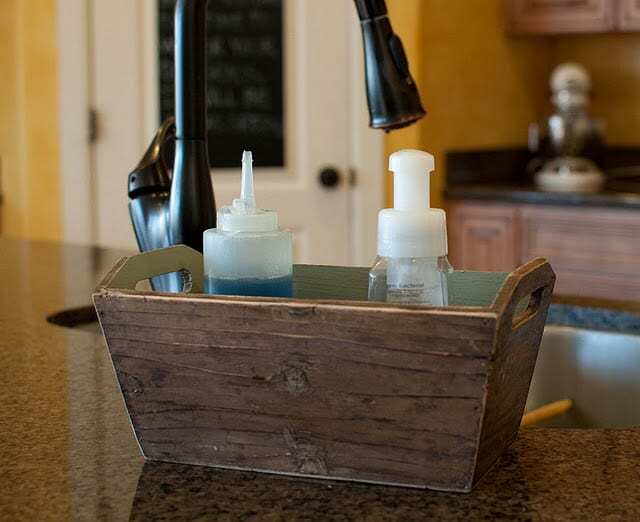 To keep my counters clean I have a little box by my sink I keep it and my hand soap in. I found the box for $1 at the thrift store and painted the inside. I also keep the little things I use a lot out of sight. It keeps my counters uncluttered and everything is still within reach! It’s been a great $2 investment! I had been trying to get something special like that at length but now I have finally got it. Thank you for sharing information about the liquid chalk board markers and to erase them with a magic marker. 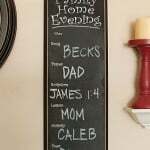 I had recently purchased a package of these markers as we had turned one living room wall into an entire chalkboard! I was disappointed to find out that the liquid chalk board markers do not erase! My daughter had wrote all over it a couple days ago and I figured I’ll have to purchase more of the chalk board paint to cover it up and pitch the markers. I’m going to go to the store and purchase the magic erase markers and hope these will do the trick as they have for you. Thank you for the helpful information!